The way is wooded, a canopy of leafy green overhead. My teenage daughter walks ten paces ahead of me in shorts and a tank top, blond-tipped ponytail cascading over her pack. I let the distance between us lengthen, frame her receding figure in my phone's lens, centered between the arc of the trees, the stone walls that flank the trail, pocked and worn, some placed a thousand years ago, or more. 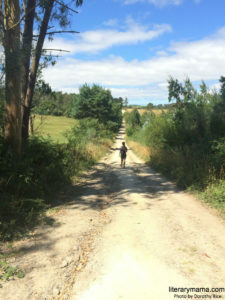 We are pilgrims, peregrinos, though of a different sort than the devout who since the early Middle Ages have travelled the Camino de Santiago, the Way of Saint James. They converge on the cathedral in Galicia's capitol city, in Spain's rugged north, to pay homage to one of Christ's 12 apostles, whose remains, according to legend, are buried there. I press the button before my daughter disappears around a bend, one of several such photos I will take over our week of hiking this quiet trail, interrupted by the occasional fellow traveler. "Buen Camino," the earnest young man from Italy, the starry-eyed student from Germany, the Spanish boys on summer holiday, call out to us in passing, as scallop shells, the symbol of Saint James, dangle from dusty packs. I haven't been in Spain in close to four decades, not since just after college when I lived in Madrid for a year, dreaming in Spanish, fancying myself an expatriate. It is my daughter's first time in Europe, a high school graduation gift for her and, for me, a belated return. We walk 15 miles a day, uphill and down, wending our way through towns with narrow cobbled streets and barking dogs, beginning in Santiago—where most end their journey—destined for Muxía, a fishing village on the Atlantic Ocean. We pause for fruit and bread from our packs, to drink water, to pee behind a bush alongside the trail, one keeping watch for the other. My daughter, the youngest of five, will leave for college in Manhattan at summer's end, far from our California home. I am content to trace her footsteps, with the occasional exclamation on this place, these hills and unexpected jungly dips, thick with ferns, with wild flowers still fresh in August—yellow, white, and orange—rivers of cold, running water and always stones, tumbledown walls, fences, the concrete pillars that mark the way forward, blue and yellow ceramic tiles with the familiar scallop shell and an arrow. Just as the distance between markers and fellow hikers seems long and we begin to wonder if we might be lost, another bright shell appears around the bend. At the crest of a steep hill, my daughter pauses, scents the wind, raises her arms overhead, a brave silhouette against a massive foreign sky. I trudge onward, count my breaths, in, out, forehead and cheeks hot with exertion, blood pumping near the surface. My feet and toes are numb. I am hungry, sticky, and tired and I have never felt better. "It's paradise," she says, reaching for the horizon, emotion at the wavery corners of her mouth, in her eyes, aqua against golden-brown. Another valley lies below us, fields fanning out for miles. In the distance, a curl of blue rimmed with white, an approaching promise, the sea. And it is. Despite the way my legs wobble when I sit then struggle to stand, despite the biting flies that leave a trail of angry red welts on her tanned arms and the mysterious hives that blossom on my right shin, hot to the touch, itchy as the devil. In the hotel that night we photograph our swollen feet, my ravaged leg. "I bet these leave scars," I say, and I almost hope they do, a fleshy merit badge. Two slender, dark-haired girls who look enough alike to be sisters, serve us in the hotel's deserted dining room, confused when we explain, as we have each evening, that my daughter is vegan. "No," we say, shaking our heads. "No milk? No cheese? No meat?" "Nada de animal," they repeat, each syllable weighted. We hear them in the kitchen, repeating it to the cook. We picture their expressions. Perhaps there are hand gestures. They return with platters of salad and cut melon, the pickled white asparagus and salty, fried peppers we are served wherever we go, potatoes sizzling with olive oil. They set each dish down with a somber flourish then hover, waiting. I smile and extend my hands, palms open. "Gracias a todos para acommodarnos," I say, which, inside my head, translated into English—thank you all for being so accommodating—sounds too formal, yet these are the words that spring from my mouth. "Our thanks to everyone, to the cook," I say, waving an inclusive hand towards the kitchen. My daughter's eyes are wide. She knees me under the table. The younger of the two servers smiles. Her cheeks dimple and flush. Both girls nod, satisfied, I imagine, as they leave us to our meal. When they are gone, my daughter exhales. She sputters. Her belly quakes with laughter. "Oh my God, Mom," she says, hunched forward, lowering her voice. "Gracias a todos?" She spreads her hands, mimicking my grandiosity. We laugh as we stab chunks of melon, the palest green, sweet as honey, at that precise moment of ripe perfection. And I do feel a bit like royalty, returned to Spain, the white tablecloth spread with nada de animal, a feast for two weary pilgrims. We are far from home, my last child and I, yet in this moment all that matters is close at hand. "Gracias a todos," I say, embracing the room, owning my inept gratitude. In the morning we will walk another 15 miles. For now we laugh and we eat.